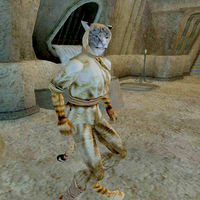 J'Dhannar is a Khajiit pauper and a Skooma addict. His former mate Ahnassi will ask you to cure him of his addiction. This can be done by giving him a copy of Confessions of a Skooma-Eater. Afterwards, he decides to leave Morrowind and go to Elsweyr. He is wearing a common shirt with matching pants. Like all Khajiit, he can see well in the dark and can demoralize others for short periods; otherwise he knows no spells. "You again? What do you want?" (After giving him the book) "J'Dhannar will read this book you gave him. Thank you again. And thank Ahnassi, and tell her... goodbye." Goodbye. "Hah! You call yourself a friend of Ahnassi? Then J'Dhannar curses you, and J'Dhannar curses this faithless mate. Ahnassi calls ME a coward and a fool, the one who is her husband, and whom she must respect? And she leaves me to beg and starve? SHE is the fool, and you are a fool, too. There IS no cure for the skooma addict! All the world knows this! No one knows J'Dhannar's shame better than J'Dhannar! But J'Dhannar is helpless. What can J'Dhannar do? Nothing. But beg and starve and cry and die...."
(If you have the book but his disposition is less than 50) "Why do you want to give me this book? What good is a book? Why do you not listen? Why should I trust you?" (If you have the book and his disposition is 50 or higher) "J'Dhannar does not understand. What good is a book? I do not want this book. But... J'Dhannar can see you have a good heart. J'Dhannar is sorry for what he says. J'Dhannar will take this book, and will read it. And you... return to Ahnassi and tell her, J'Dhannar is sorry, and J'Dhannar forgives her, and J'Dhannar will always have Ahnassi in his heart, but our bond is broken now, for better or worse, and we must each find our own way from this cold time and hard place." (After giving him the book) "J'Dhannar will read this book you gave him. Thank you again. And thank Ahnassi, and tell her... goodbye." "Trade? J'Dhannar has no trade. J'Dhannar has the sugar? What does J'Dhannar need with trade? Just go away and leave J'Dhannar alone." (After giving him the book) "J'Dhannar has no trade. J'Dhannar once had a trade. Before the sugar. J'Dhannar remembers. Everything was different before the sugar." This page was last modified on 1 April 2015, at 03:13.